Abraham Hicks is unquestionably one of the leading teachers of the Law of Attraction. Since the 1980's, they have guided millions of people around the world on how to produce profound transformations in their lives. Their Law of Attraction teachings can be found in CDs, books, DVDs, conferences, and more. 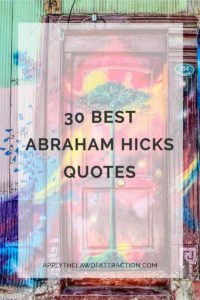 I've selected some of my favorite Abraham Hicks quotes to help you learn from their teachings. These quotes from Abraham Hicks cover such topics as joy, love, fear, letting go, success, and more. “Begin telling the story of your desire, and then add to it the details of the positive aspects that you can find that match those desires. And then embellish your positive expectation by speculating with your good-feeling Wouldn't it be nice if…? examples. “When you are able to close that vibrational gap between what you’re asking for and what Source has already answered so that your vibration in the moment is in the same vibrational place as your desire, then you can receive the inspiration. Then you can begin to realize the details of what you've been asking for. “Most rarely align with their true power, because it seems illogical to them that there is power in relaxation, in letting go, or in love or joy or bliss. Most people do not understand that their true power lies in releasing resistance – which is the only obstacle to their true power. “We want you to understand that abundance expands proportionately to match desire, and that there is great untapped abundance not yet allowed by the very humans who have created it. When your life experience causes a focused desire within you, the means to fulfill that desire is created at the same time – but you have to be on the Vibrational wavelength with your desire in order to see the path to the fulfillment of it. Great selection of quotes! My favorite is the sixth one down about instantly changing your vibration in order to attract the instant manifestation of what you want.